Five children from the state have bagged the Jeevan Raksha Padak series of awards, two of them getting it posthumously. Wills Youth rained goals to humble the Nagar Nigam 5-1 during the Ram Bahadur Chhetri Memorial Football Tournament here today. Sitting MLA from Sahaspur Rajkumar’s dharna at the Gandhi Park in protest against the denial of ticket from Dhanaulti has failed to have the desired effect on the BJP leadership but it has managed to catch the eye of the Election Commission that has now served a show-cause notice on him for violation of the model code of conduct. To evade election duties the government employees have already begun approaching the Doon Hospital for medical certificates so that they could be exempted from election duties. The politics in dissidence group of the Uttarkhand Kranti Dal (D) is taking turns with each passing day. The group, which till yesterday, talked of floating its own party and fighting elections under the name of its acting president, Luxman Singh Chufal, today did not mention anything about it in the press conference held in the city. With the announcement of Congress ticket from the Dhanaulti seat in favour of Manmohan Singh Mall, the latter began his election campaign at Thatyur in the Jaunpur block today. Manmohan Singh Mall, Congress candidate from the Dhanaulti Assembly segment in Tehri Garhwal district, addresses a gathering in Thatyur village on Friday. After losing the ticket race from the Dhanaulti constituency to Manmohan Singh Mall, senior Congress leader from the constituency Jot Singh Bisht resigned from the party today. Bisht, after a meeting held at Thauldhar where more than 2,000 persons were present, decided to quit the party after providing his services for 29 years. He has now announced to contest the Assembly poll as an Independent. Dehradun, January 6 The district election officer, Dileep Jawalkar, District Magistrate, said he expected that all the political parties and candidates contesting the elections would send the publicity material meant for various newspapers and news channels to the committee constituted to verify such material. The structure of the proposal could be submitted to the in charge of election expenditure or the District Information Officer for the purpose. The committee will then decide on these proposals. The Congress candidates from Ghansali and Narendar Nagar filed their nomination papers today. While the Congress has gained a fair amount of political mileage from its star campaigner Rahul Gandhi’s Dehradun rally and BJP banking on LK Advani, Sushma Swaraj, Smriti Irani, the Bahujan Samaj Party (BSP) is now banking on its party supremo Mayawati’s electoral rallies in Uttarakhand. District Election Officer Dileep Jawalkar monitored the nomination arrangement in the city. SSP GN Goswami was also with him to ensure the safety measures. Uttarakhand Chief Electoral Officer Radha Raturi has said that in directions issued to all recognised national and state political parties, the Election Commission has asked them to avoid the use of polythene or plastic for the preparation of publicity material such as posters banners etc. 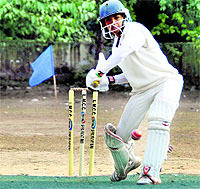 Dehradun, January 6 The Himachal team and Punjab team won their respective matches in the ongoing 26th Banke Lal Shah Under-15 Memorial Cricket Tournament here today. In the first match, Himachal beat Khail Gao Allahabad by 84 runs. Opting to bat first, Himachal scored a total of 148 runs at the loss of eight wickets. Responding to the first innings score, Khail Gao Allahabad fell short of the target by 84 runs and lost the match. The team scored 64 runs. The President of the country approved the conferment of the Jeevan Raksha Padak-2011 in Delhi today. The state’s Kapil Negi has been awarded Uttam Jeevan Raksha Padak (posthumous). Kapil had saved children from drowning in Rudraprayag district of the state last year. He lost his life in the process. Shruti Lodhi has also been honoured with the same award (posthumous). Shruti died tragically while saving her colleagues from a falling tree during a marathon in Dehradun. Similarly, Priyanshu Joshi from has been bestowed the Jeevan Raksha Padak for saving himself and his sister from a prowling leopard in the Premnagar region of the state few years back. Reeta and Lakshman too have bagged the award. Jeevan Raksha Padak series of awards are given to children for meritorious act of humane nature. The award is given in three categories, namely Sarvottam Jeevan Raksha Padak, Uttam Jeevan Raksha Padak and Jeevan Raksha Padak. The decoration of the award, which includes medal, certificate signed by the Home Minister and a monetary allowance is presented to the recepients. The lump sum monetary allowance is given at the rate of Rs 75,000, Rs 45,000 and Rs 30,000 to the recepients of the Sarvottam Jeevan Raksha Padak, Uttam Jeevan Raksha Padak and Jeevan Raksha Padak respectively. 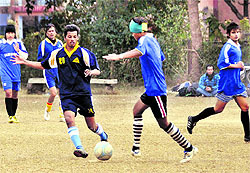 Arpan netted three goals for his team. He scored in the 15th, 25th and 28th minutes of the game while Vijay and Vijender struck one goal each in the 40th and 50th minute for the winning team. On the other hand, Brijesh of the Nagar Nigam team could score only one goal in the 27th minute of the match. In the second match, Doon Star edged past Doon United 2-0. Vijender Singh Negi and Dheeru Negi scored one goal each for the team in the 15th and 52nd minute, respectively. Meanwhile, Doon Star is scheduled to meet Bajrang Club and Garhwal Sporting will battle it out with Wills Youth tomorrow. Taking cognisance of the media reports, returning officer (Rajpur Assembly seat) Harak Singh swerved the notice on him asking him to explain why he held a dharna in the prohibited area. However, the MLA denied he had staged a dharna at the park and instead said as he had come to meet his supporters who had collected at the park and had only gone to visit them and stroll around the park. “The show-cause notice has been served on the MLA and an officer has also been entrusted for conducting an inquiry. The MLA was found staging a dharna along with his supporters at the park where the Municipal Corporation has prohibited this kind of gathering. 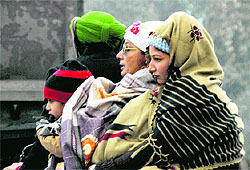 We have given him two days to respond to the notice,” said Rawat. Similarly, the case of sitting MLA from Yamkeshwar Vijaya Barthwal who had allegedly distributed calendars and diaries among the residents is also being examined. The Election Commission has already served show-cause notices on Tourism Minister Madan Kaushik while cases of violation of the model code of conduct against former Chief Minister Ramesh Pokhriyal Nishank are being examined. However, to prevent bogus cases and discourage evasion of duty, a panel has been constituted that would examine the cases of those employees admitted to the hospital. The Principal Superintendent of the Doon Hospital, Dr BC Pathak, today constituted a panel of medical experts to study applications of government employees seeking exemptions from election duties. The panel would examine only those cases of employees who are admitted at the government hospital and grant them exemption only if their cases merit exemptions. The panel comprises Dr KC Pant, senior physician, Dr SD Saklani, surgeon, Dr JS Rawat, orthopaedician, Dr BC Ramola, eye surgeon, Dr Alok Jain, ENT surgeon, Dr Anil Mishra, pathologist, and Dr SC Kuriyal, radiologist. “The government employees have already started coming up with flimsy ailments and everybody cannot be issued medical certificates. The cases of such employees admitted to the government hospitals would be examined by the team of experts,” said Dr Pathak. The politics in dissidence group of the Uttarkhand Kranti Dal (D) is taking turns with each passing day. The group, which till yesterday, talked of floating its own party and fighting elections under the name of its acting president, Luxman Singh Chufal, today did not mention anything about it in the press conference held in the city. Chufal talked of fielding ten rebel candidates as Independents in the elections and beginning the process of party formation only after the elections. He also did not deny joining hands with the UKD (P) saying anything was possible in politics. He said the 21 party candidates, whose names had been announced, began making preparations when the party got symbol from the Election Commission of India and spent lakhs of rupees in this process. Now stepping back from the commitment was like doing injustice to the people, he added. He confirmed having received 150 resignation letters of the party office-bearers and workers and further affirmation of resignation from the Kumaon wing as well. On the other hand, Satish Semwal, party spokesperson, said as per the decorum, vice-president’s resignation letter was sent to the president which they had not received till now. But he expressed hope that they would be able to win over Chufal once Bhatt arrived in town from his constituency, Devprayag. Meanwhile, the UKD (P) had been deliberating on the names for the second list throughout the day which will be finalised in the central committee’s meeting tomorrow. Congress supporters gathered in a large number in support of Mall and also raised slogans in favour of the party. Mall inaugurated the party election office at Thatyur on the occasion. District Kisan Morcha president Devi Singh Chauhan, who was also in the fray for the ticket from Dhanaulti, has also extended his support to Mall. 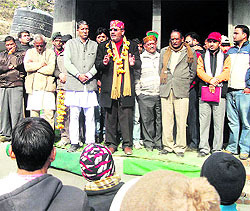 Former Youth Congress president Shailendar Singh Bisht said it was indeed a great opportunity for the Congress in Dhanaulti as BJP leaders were at loggerheads with each other over the distribution of party ticket thus proving that their leaders were self-centred and cared only about personal gains and not the party. Megh Singh Kandari, another youth leader from the region, appealed to all workers to convey the development message of Rahul Gandhi and Sonia Gandhi to every household so that Mall could win the Dhanaulti seat. Mall said if the party leaders remained united, it would surely won the Dhanaulti seat. Mall claimed that the Congress would surely win as the BJP government had always “neglected” the region due to which all development works had come to a standstill. Lashing out at the state government, Mall said despite having a Cabinet minister from the constituency, the area had not seen any development in the past five years. Mall reiterated that he was contesting on development plank and gave an assurance to the voters that if he was given an opportunity this time, Dhanaulti would be brought back on the path of development. Former MLA, Dhanaulti, Kaul Das, Zila Panchayat members Bharat Singh Chauhan and Sarthama Devi, Congress block president Vijay Singh Gusain and senior party leaders, Ratan Mani Bhatt, Tara Chand Aswal, Rajbala Aswal, Sulochna Gaud and Pooran Raunchela were also present on the occasion. Bisht said by denying party ticket to him from the constituency, the party leadership had not done justice as it had given the ticket to that leader who had no significant role in the constituency. Bisht further said the Congress did not consider his 29 years of service and gave the ticket to Mall who was active in Mussoorie and not in Dhanaulti. Bisht said in his support a large number of Congress workers had also resigned and pledged their support in his favour irrespective of the party lines. The district election officer, Dileep Jawalkar, District Magistrate, said he expected that all the political parties and candidates contesting the elections would send the publicity material meant for various newspapers and news channels to the committee constituted to verify such material. The structure of the proposal could be submitted to the in charge of election expenditure or the District Information Officer for the purpose. The committee will then decide on these proposals. Subodh Uniyal from Narendar Nagar and Dhanilal Shah from Ghansali, along with their supporters, reached the nomination centre at New Tehri and filed their papers. The supporters of both candidates stayed at the nomination centre till the end. However, the fanfare attached to the nomination was missing due to the strict guidelines of the Election Commission this time. Dhanailal Shah said he would work for the development of his constituency and try to introduce religious tourism here. Subodh Uniyal also thanked the high command for giving him the ticket and he claimed that the Congress would definitely form a government in the state. Slated for just a week before the polling date, Mayawati, a four-time Uttar Pradesh Chief Minister, will be launching the party election campaign from Roorkee on January 23. Uttarakhand BSP chief Suraj Mal said the firebrand party chief would be addressing a mega BSP rally at Nehru Stadium in Roorkee. The DM gave necessary directions to returning officers (RO) while monitoring nomination rooms of the Dharmpur, Raipur, Rajpur Road, Dehradun Cantt, Mussoorie and Doiwala constituencies. He directed the RO to give all the directions and information regarding candidates outside the nomination rooms and works to be wrapped up under the single window system. He allowed only three persons to go inside the nomination rooms and enforced Section 144 in the area. He said none of the candidates came to file the nomination on the first day. The candidates had received 60 nomination forms for ten constituencies. Meanwhile, Assistant Election Officer, Sahaspur, said Prakash Joshi, son of Janardhan Prasad of Ambiwala village, led a procession from the main gate of Vikas Nagar without taking any prior permission when they were busy with the election work and defied the election code of conduct. He said action would be taken against him. She said all political parties and candidates had been directed to desist from using polythene and plastic in their publicity material. She said the use of polythene or plastic in publicity material was detrimental to environmental conservation. Therefore, strict action would be initiated against the defaulters, including the confiscation of publicity material. In case if any publicity material manufactured from polythene or plastic is found to be in the possession of any publicity material dealer, the same would be confiscated. The Himachal team and Punjab team won their respective matches in the ongoing 26th Banke Lal Shah Under-15 Memorial Cricket Tournament here today. In the first match, Himachal beat Khail Gao Allahabad by 84 runs. Opting to bat first, Himachal scored a total of 148 runs at the loss of eight wickets. Responding to the first innings score, Khail Gao Allahabad fell short of the target by 84 runs and lost the match. The team scored 64 runs. Meanwhile, in the second match, Punjab defeated Uttar Pradesh Red by three wickets. After winning the toss, Punjab team elected to bowl first. Uttar Pradesh Red scored a total of 72 runs (all out).